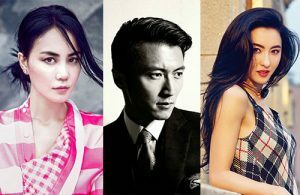 It’s been over six years since Nicholas Tse (謝霆鋒) and Cecilia Cheung’s (張栢芝) divorce of the century, and it was a breakup that shook the entertainment circle. Nicholas and Cecilia were married for five years before the split, and their tumultuous and very-public romance got many people invested. Nicholas and Cecilia broke up several times before finally getting married in 2006. The fans were happy for them—both Nicholas and Cecilia grew up with divorced parents, both Nicholas and Cecilia had a very public personal life that got beyond their control. Despite sharing many obstacles together, the couple ultimately decided to file for divorce in August 2011. They currently share custody of their two sons, Lucas and Quintus. The former couple’s private lives were brought back to the spotlight in 2014, after Nicholas confirmed that he had rekindled his old relationship with Faye Wong (王菲), who he dated from 2000 to 2002. This also came a year after Faye divorced her ex-husband Li Yapeng (李亞鵬), with whom she has one daughter with. Now almost four years into his relationship with Faye, the media is wondering why Nicholas stil hasn’t married her yet. The media has also noticed that Cecilia is still single. Is it the fear of marriage, or do Nicholas and Cecilia still love each other? According to the Chinese media, Nicholas once confessed in an interview that Cecilia would occasionally call him and tell him that she missed him. He, however, wouldn’t know how to respond. Cecilia’s honest and straightforward confession is perhaps the reason why Cecilia is still single—she still misses Nicholas and cannot forget about him. Their complicated love triangle will continue to captivate the public. what’s there to love? he’s w/ someone else and does not reciprocate. she needs to move on, so many nice boys out there. @m0m0 True but sadly some people can never truly move on, especially when they have children together. Very sad indeed. I wonder if they still have fate together or not? No matter where he is and who he is with, somehow they will always be connected to each other in some way because they are parents of the kids and it won’t ever change. I also wonder if fate will bring them back together? I believe that if Nic really loves or still loves Cecilia, he wouldn’t go back to Faye and stays with her for so long. To me, his true love is with Faye. He only cares about Cecilia because they have common children and she is taking care of the kids for him. I hope they still have fate since I think deep down, Nic still has feelings for Cecilia. But then he also still loves Faye too and he of course cannot be with both of them at the same time. This is truly sad but time will tell and it depends on fate and destiny. She remains single because of the children. Sorry, but this article is a stretch lol. Not wanting to get married again doesn’t have anything to do with love. Maybe Faye, Nic & Ceci are all tired of combining assets/titles/complications in case they break up? I know a lot of folks who don’t want to get married once they’ve made it through the wringer on their last divorces. It doesn’t surprise me at all that none of them want to complicate their situations again by getting married. Plus it’ll get all the tongues wagging if any of them make that move to be official. There’s no benefit that I can see from putting a ring on it. @coralie spot on. Indeed why complicate things when things are beautiful at status quo? Every woman wanna experience the euphoria of being a bride once in their lifetime (walking down the aisle dressed in the “WHITE” wedding gown) and after been there, done that why bother again? I definitely wouldn’t. At the end of the day, the most important thing is to find someone compatible to accompany you. Totally AGREE. And why are folks still speculating about them or interviewing her about him? She must be crazy to want to end up with Nicholas again. From all accounts, Cecilia was single-handedly manning the fort for the kids too when he was cavorting with Faye. “At the end of the day, the most important thing is to find someone compatible to accompany you.” => WORD. Plus, learning to be happy and independent by yourself first. Too many do not realize this, and expect/depend on a partner to make them happy. At the end of the day, life has no guarantees. Even in the happiest of relationships. @nomad822 Absolutely spot on. We cannot rely on others to make us happy. We can hope to find someone to share our life journey with. they have been together for so long and share 2 sons.. hard to just break things off.. and all of them been married and it ended in divorce, so why would they want to jump back into a marriage if all is well now? crazy article. I think the article got it wrong. I think his true love was Faye Wong. And why not married is maybe because Faye doesn’t want to. or they could be secretly married. I think Nic loves Faye Wong more than Cecilia too. The reason is personality clash. Cecilia was concerned about his assets and properties, and fought with him about it. Faye seems like more laid back and doesn’t care.